:The latest release from one of the Gaither's most impressive vocalists. Gordon Mote is one of the brightest emerging artists today. For the past several years he has graced the Gaither homecoming stage with his considerable vocal prowess and keyboard skills to the delight of Gaither fans all over the world. Mote has appeared on recordings by some of the most recognisable names in the music industry such as Sheryl Crow, Lionel Richie and Alison Krauss. This latest project is an inspirational music diary of songs which not only shaped his music and ministry but also a generation of music lovers. 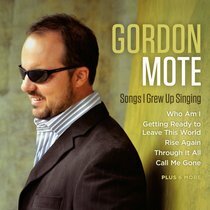 About "Songs I Grew Up Singing"
Totally blind from birth, Gordon Mote's childhood in rural Alabama was not quite the same as other boys his age. Many challenges faced the young lad and his brother, who was also born blind, but the Mote family clung to the promises of God's Word, particularly Jeremiah 29:11. "Our parents always encouraged my brother and me," Mote remembers. "They believed we could excel in whatever we chose to do, as long as we placed Christ at the center of our goals and our lives, and that's what we did." Mote was drawn to music, and on Thanksgiving Day, a young three-year-old Mote stunned his parents when they heard him playing "Jesus Loves Me" on the piano, with both hands. No doubt, their son was blessed with an extremely unique, God-given gift, and they encouraged him to perfect his musical gifts. Whilst in college, Mote began capturing the attention of some of the music industry's brightest names, including Grammy winning recording artist Lee Greenwood, who hired Mote as keyboard player and background vocalist just two days after graduation. In 2005, much to the delight of both Country and Gospel music fans, Mote released his debut solo recording, If You Could Hear What I See. The recording earned a Dove Award nomination from the Gospel Music Association for Instrumental Album of the Year. This nomination marked the first of many honors and accolades Mote has received, including the 2011 Diamond Award for Favorite Instrumentalist. Gordon and his wife, Kimberly live in the Nashville area with their three children. Adapted from www.gordonmote.com. Viewed 21.07.14.